Mercer University Press: 1, 2, 3 TEAM! Zoey has always been the star of the team. She believes she can win games all by herself. But when a new coach arrives, Zoey must learn that it takes more than one player to make a team. This read-aloud book follows one young athlete as she learns how much better it is when all players work together. 1, 2, 3 TEAM! will have your listeners yelling “TEAM” in unison before the final page. Susie Gardner knows the importance of being a good teammate. As an NCAA Division I women’s basketball coach, she values those traits which make her college athletes good team players. Gardner has incorporated her love of children’s books into her coaching and uses them as motivational tools with her teams. 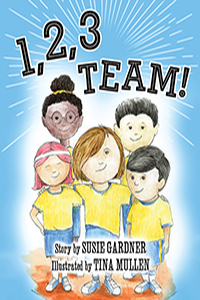 It’s never too early for children to learn to work together—more “team” and less “me.” The watercolor illustrations of award-winning artist Tina Mullen capture the energy of the story and bring life to the playful personalities of Zoey and her teammates.